I’ll start this story out by saying my dad is typically pretty good with directions in the woods, to the point that when I was younger I really wouldn’t pay attention and I would just follow along with him. Now I know better – much better! We had been hunting for about 3 hours already, and had 4 or 5 grouse between the two of us. It was a perfect fall day for grouse hunting with temps around 50-55 degrees & many of the leaves having blown off the trees the evening before. It was our first hunt of the year where we could actually see a decent ways in the woods, and we were having a blast. It was one of those days where we were just letting the dogs do their thing & following them. When we decided to head back, my dad started us in the direction we thought the truck was. I wasn’t paying attention and didn’t know any better so I just followed him. We were certainly still hunting, but now we were just hunting in the direction of the truck (or so we thought). Well about 3 hours later we finally popped out on a logging trail that we didn’t recognize at all. Our morning hunt had definitely turned into an all day adventure. We did end up finding our truck an hour or so later, & finally figured out what we had done wrong when we got back and looked at a map. The logging road that we parked on made a turn & doubled back not far from where we were parked, and we ended up only missing it by a hundred yards or so. Needless to say, every time my dad talks about a shortcut I now give him a hard time. I also actually pay attention to where we’re going now. My dad really is good with directions in the woods, but when you’re in good grouse habitat you really only need to be 50 yards off the mark to get lost. Visibility is pretty terrible in that thick cover, and that’s certainly what got us that day. After that, we got a decent little handheld GPS unit for upland hunting. We don’t necessarily even look at it all the time, but we always have it with us just in case we get turned around and need a little correction. Before I dive into it the list, let’s break down my criteria for grading. Each category is graded out of 10 points, and I add them all up for you at the end. Pretty simple stuff! Ease of Use: We aren’t looking for every possible bell and whistle on them, just what we need to get by. Size: Should fit easily & comfortably in a pocket. Durability: Upland gear takes a beating. A good handheld GPS unit needs to hold up. Notes: This Bushnell BackTrack GPS was the first handheld GPS unit for upland hunting that we bought. It’s a decent little unit, and gets the job done for the most part. One thing that we noticed over the years is that in order for it to get the direction correct you want to be walking. Not a deal-breaker by any means, but still worth noting. It’s definitely easy to use compared to other units out there, but obviously comes with more limited features. The battery life is pretty good, but we deducted points for size (it’s actually larger than you would think it is) & durability since it doesn’t feel quite as solid. All in all, this is a pretty good little handheld GPS unit for upland hunting. It’s really only designed to get you back to your original location (hence the “BackTrack” in the name), so its features are pretty limited. It also comes in blaze orange, which is kind of nice in case you noticed you dropped it 20 yards back and need to look for it. 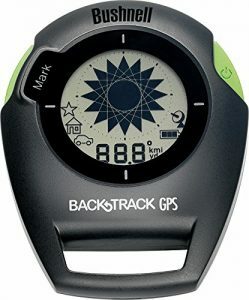 For someone looking for a simple, easy-to-use GPS this is definitely a solid option. Notes: There’s no way we were going to have a list of handheld GPS units for upland hunting without including a Garmin on the list. 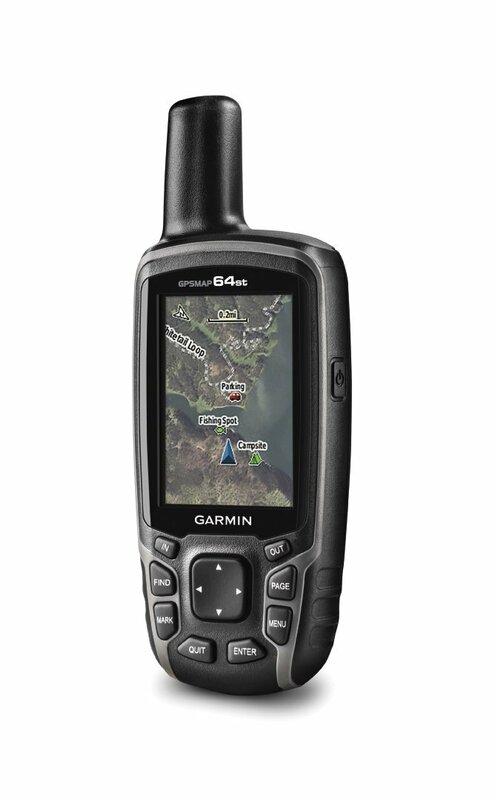 Garmin has another winner on their hands here with the GPSMAP 64. It’s nice and small, has great battery life, and feels like you could put a load of bird shot into it if you really wanted to. While we deducted points for price, it is still a pretty good value for the money. With a color screen & the ability to upload topographical maps, this has all the bells and whistles you would ever need on a handheld GPS unit for upland hunting. A really nice feature for long weekends where you don’t have access to power, the Garmin GPSMAP 64 has a dual battery feature. With this feature, you can swap out the standard rechargeable battery pack with two AA batteries. After all, a GPS doesn’t do anyone any good if the batteries are dead! Add in the ability to mark locations for any sort of hunting you do, & I’d highly recommend this unit. Notes: Holy $H*! this is one fancy GPS! To be honest I’m not really sure what anyone would need something quite this nice for, but to each their own. It has a ton of features, even including a camera for taking pictures of your hunt with. 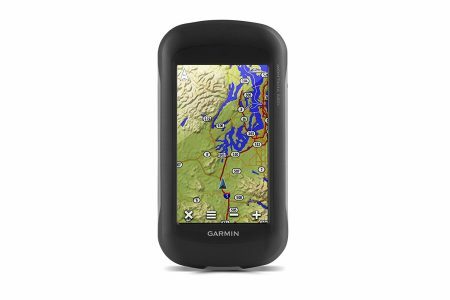 It comes preloaded with all the maps you’d need, and the only major drawback of the Garmin Montana 680t is the price. It’s by far the most expensive unit on our list, but it’s also the nicest. Notes: This is probably our favorite GPS on the list, especially considering the price. The Garmin eTrex comes in three different models, but for the sake of simplicity we’re going to only review their base unit – the eTrex 10. The eTrex 20 & eTrex 30 obviously have additional features at a slightly higher price point. The Etrex 10 model is definitely the most “dumbed down” model of the three. It has a standard black and white display, and the controls are super simple. While it certainly doesn’t have as many bells and whistles as a few other units on the list, it definitely gets the job done. Much like the GPSMAP 64t, it feels solid as hell and I really feel like you’d have a hard time breaking this thing. 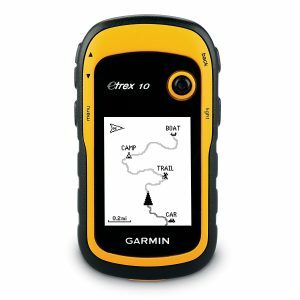 If all you’re looking for is a GPS to help you get back to your truck and maybe mark a few spots for future hunts, the Garmin Etrex 10 is definitely the model for you!